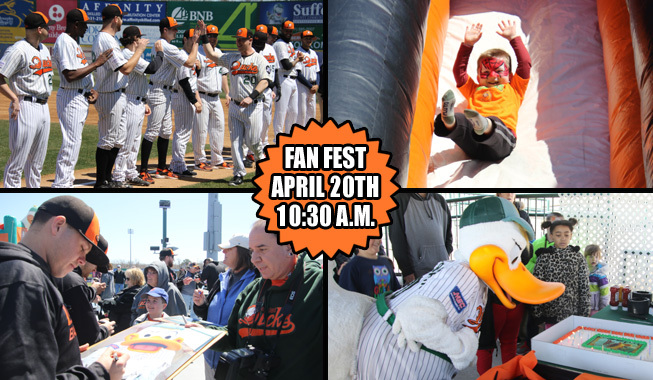 (Central Islip, N.Y., April 3, 2019) – The Long Island Ducks today announced the team’s Seventh Annual Fan Fest at Bethpage Ballpark will take place Saturday, April 20, starting at 10:30 a.m. Admission will be free of charge for all fans. Fan Fest is the first opportunity for Ducks fans to watch the team take the field in advance of the 20th Anniversary Season, presented by Good Samaritan Hospital Medical Center. The Ducks will take the field for batting practice beginning at 11:00 a.m., and fans can enjoy the one-day-only chance to watch them take BP. The full Ducks roster will then be introduced along the first base line prior to the team’s spring training game, set to begin at 1:00 p.m. New Ducks Manager Wally Backman will lead the Flock as they take on their Liberty Division foes, the New Britain Bees. Fans in attendance will be able to enjoy several fun-filled activities taking place along the main concourse. Three Ducks inflatables, all brand new for the 2019 season, will be open for children (weather permitting). These include the Bounce House, DuckTail Slide and Obstacle Course. Fans will also be able to enjoy video game play on the Microsoft HTC VIVE Virtual Reality Gaming experience, which will be set up on the main concourse behind home plate. Additionally, Dina’s Dynamics Face Painting will be in attendance for kids to get designs painted on their face free of charge. The Waddle In Shop will be open for fans to stock up on new gear for the 2019 season, including brand new 20th Anniversary Season apparel. Additionally, select concession stands will be open during Fan Fest for fans to try some delicious ballpark fare. While all of this takes place, a pair of exclusive events will also be going on for select Ducks fans. The annual VIP Season Ticket Holder Barbecue will be held in the picnic area along the left field line for those with full season ticket packages. The event includes an all-you-can-eat assortment of food, beverages and snacks, and visits from Ducks players and coaches will take place during batting practice. Season ticket holders can also pick up their 2019 VIP Gift during Fan Fest by visiting the Customer Service Center, located on the main concourse inside the West Gate. Fans interested in becoming a VIP season ticket holder and gaining access to the barbecue should contact the Ducks ticket office at (631) 940-3825, ext. 115 or 116. Members of the Ducks Kids Club, presented by Bethpage Federal Credit Union, will have the chance to celebrate QuackerJack’s Birthday. QJ’s party will take place at 11:30 in the Smokin’ Al’s Party Deck, located along the left field line adjacent to the playing field. Kids Club members can sing “Happy Birthday” to the nine-time Best Long Island Mascot, while Duck Donuts will be providing a special donut birthday cake for all members to enjoy. Current Kids Club members who have not yet registered can do so by emailing jschiff@liducks.com to confirm attendance. To sign your child up for the Kids Club and attend QuackerJack’s birthday party, please contact the Ducks community relations department at (631) 940-3825 ext. 102 or CLICK HERE. The entire Ducks spring training schedule, as well as any additional information regarding Fan Fest, will be announced later this month. Please stay tuned to LIDucks.com for more info, or CLICK HERE to sign up for the team’s e-mail newsletter.